Only ten percent of the thousands who suffer from cardiac arrests outside of the hospital will survive, which is why performing CPR is important. The Rebreath Resuscitation Pocket Mask with Valve is a portable device that ensures you stay protected from cross-contamination while performing lifesaving mouth-to-mouth resuscitation. Cardiac arrest occurs when the heart stops pumping blood around the body and brain, so acting quickly is crucial. Cardiopulmonary resuscitation, or CPR, is an emergency procedure where someone performs gives a series of rescue breaths, along with chest compressions, to a casualty in order to aid their blood and oxygen flow. The Rebreath Resuscitation Mask fits comfortably over a victim's face, and at the top of it sits a one-way valve that ensures breath can be given with control and accuracy during mouth-to-mouth resuscitation. The mask acts as a practical barrier to offer the rescuer protection against cross-infection when manually resuscitating patients. The mask can be used on persons of any age, and the transparent dome also allows for the person administering CPR to clearly check lip colour and any perspiration from breathing, without having to remove the mask. The Resuscitation Pocket Mask is enclosed in a blue clamshell bag to keep it protected, and comes with an instruction leaflet detailing guidance for use. It is small enough to store in first aid kits, handbags, glove compartments and other similar tight places. You will always feel prepared in the event of an emergency carrying one of these around. 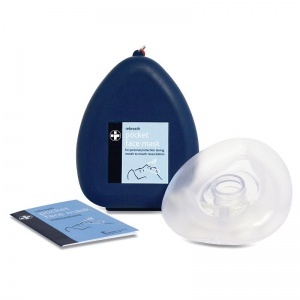 The Rebreath Resuscitation Pocket Mask with Valve is usually dispatched via First Class Royal Mail and delivery should be within 1 to 3 working days.